Chris painting portraits on December 20th, 2016. 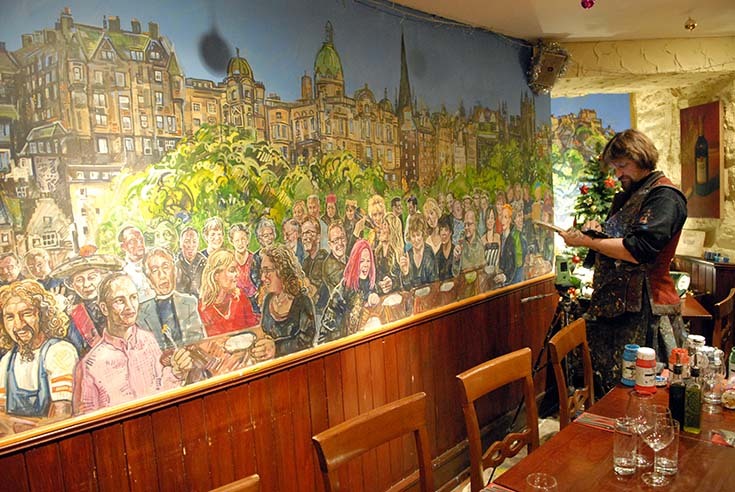 I am currently painting a new mural for the William Street restaurant ‘A Room in the West End’, an Edinburgh establishment downstairs from Teuchters pub. I have dined there a number of times, most recently on my 40th birthday and I know the owner Peter Knight through my long affiliation to Boroughmuir Rugby Club. 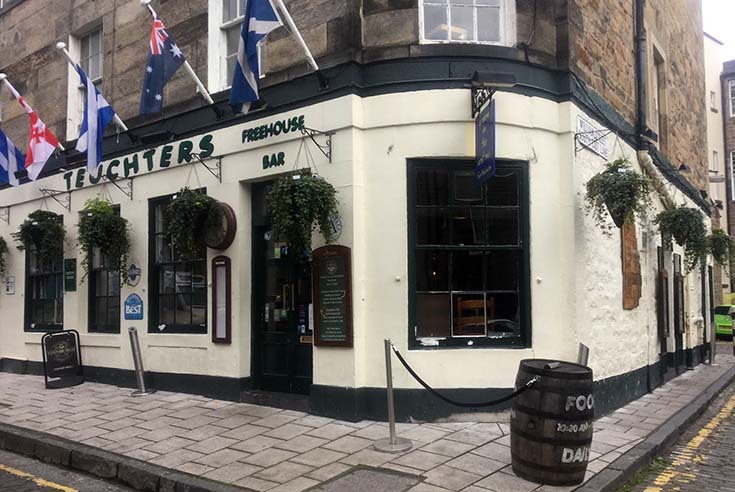 The exterior of Teuchters pub in Edinburgh; the Room In the West End restaurant is located inside and down the stairs. 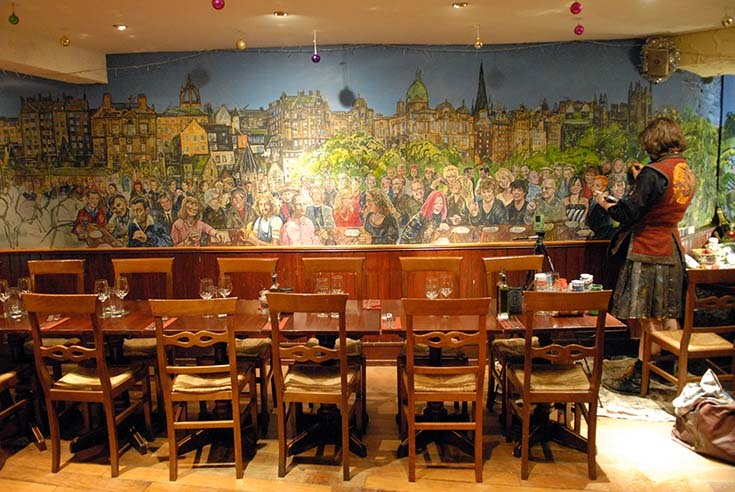 They already had a mural in their cosy subterranean location, but the last time that I dined there I mentioned to Peter that I thought it was looking a little tired and dated. I suggested that they could do with a rethink as it wasn’t adding value to the restaurant. It took a year or so but Peter came around to my line of thinking and agreed to have me fix it for them. The initial design of the mural for the restaurant walls. 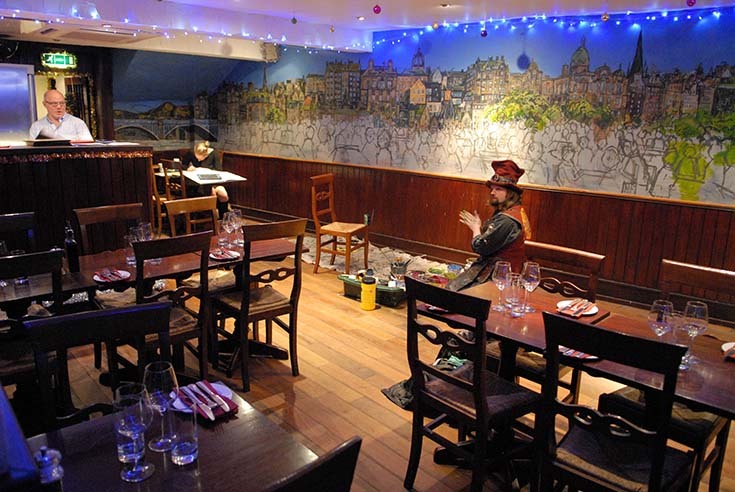 The brief as was to reflect the West End/Central Edinburgh location, to visually push the wall back with added depth, but also make the room look exciting, populous and atmospheric. Ideally the mural would become a talking point and would make the restaurant a destination venue. I decided to combine my signature crowd mural concept with a 12m landscape depiction of Edinburgh’s Old Town, sweeping across the skyline from North Bridge to Edinburgh Castle. 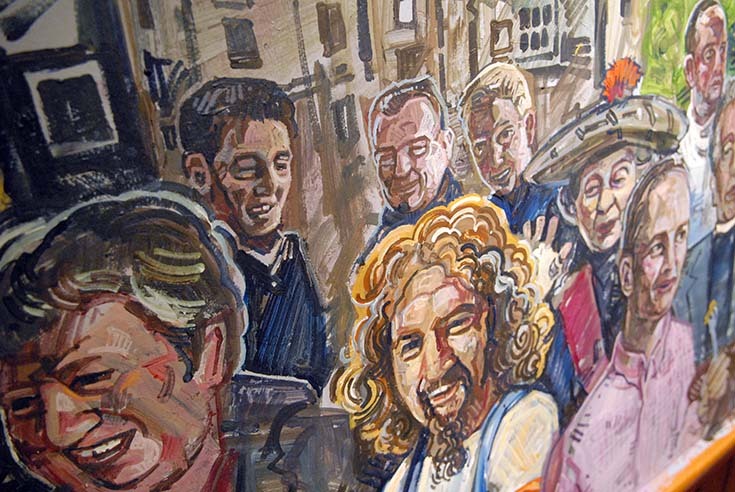 Billy Connolly and Super Gran lurk amongst the well-kent Scottish figures in the mural. Originally the discussion as to who would be painted into the crowd revolved around the use of regulars, locals and restaurant staff, but also with a strong rugby element as the pub is a haunt of the Six Nations Championship revellers. 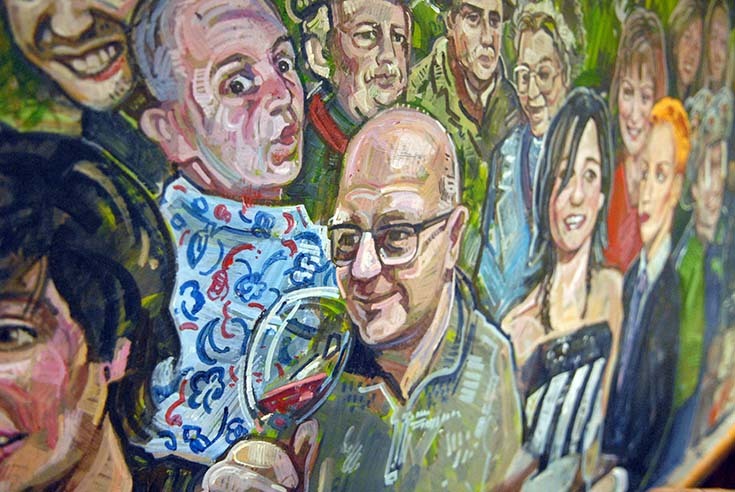 However the mural has quickly become a nostalgia piece to innumerable Scottish celebrities and the crowd is now a 50/50 mix of celebs and punters, which should result in visitors looking more closely at the painting in order to identify the well-kent faces amongst the lesser-known crowd. My crowd scenes frequently feature one or two celebrities but largely my focus has been on the general public. In my twenties I worked for as a magazine illustrator, painting for over 30 different magazines and they would often ask me to paint celebrity portraits within the context of editorial illustrations. So working on this mural has in many ways felt like a blast from the past for me. 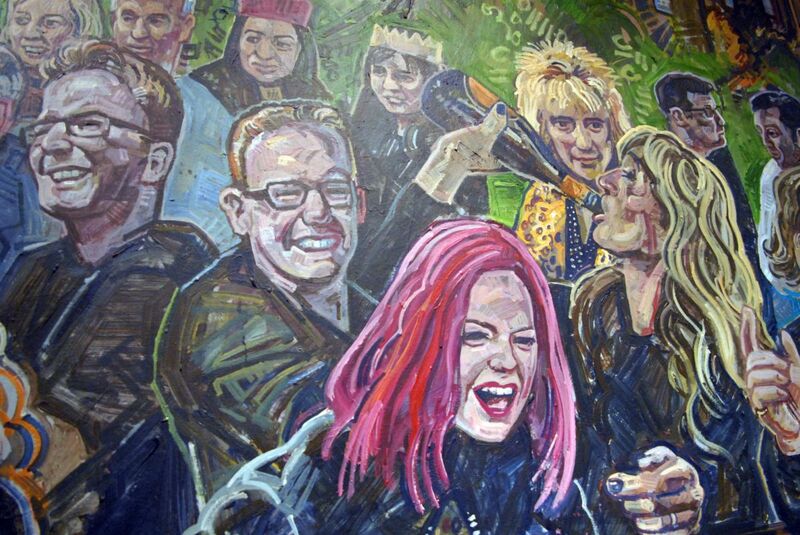 Scottish musicians The Proclaimers, Shirley Manson and Rod Stewart join in the revelry in the mural. 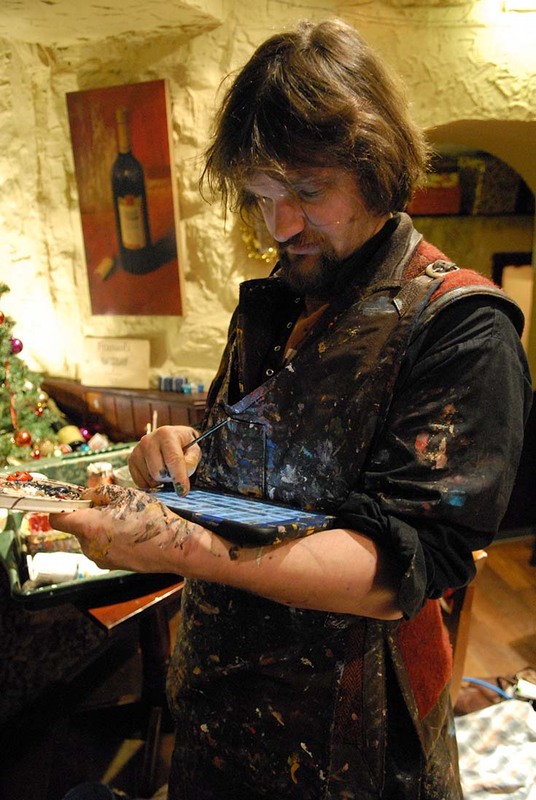 Chris using his ever-present iPad for photo reference during the painting of the mural. The extra muscle memory from painting around 6000 portraits in the last five years has meant that I have found this task considerably easier than I used to. The internet has improved celebrity photo reference immeasurable – laying hands on good celebrity photo reference is so much easier and allying that with my ubiquitous iPad has allowed the mural to build relatively easily. 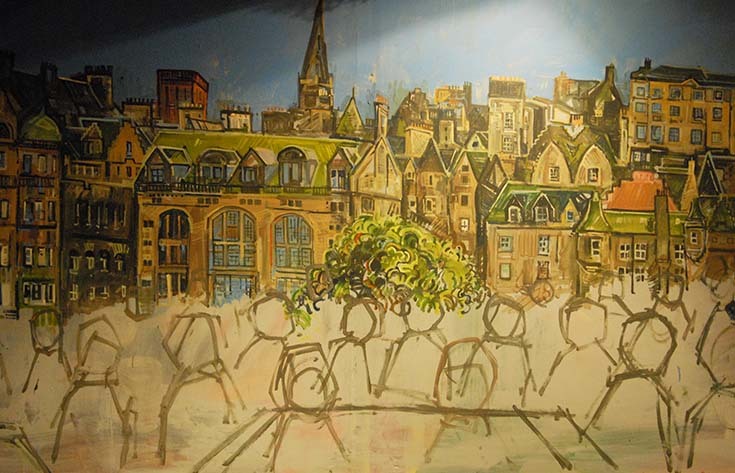 Some of Edinburgh’s Old Town buildings depicted in the mural, looming above the ghostly outlines of people whose portraits are waiting to be painted. 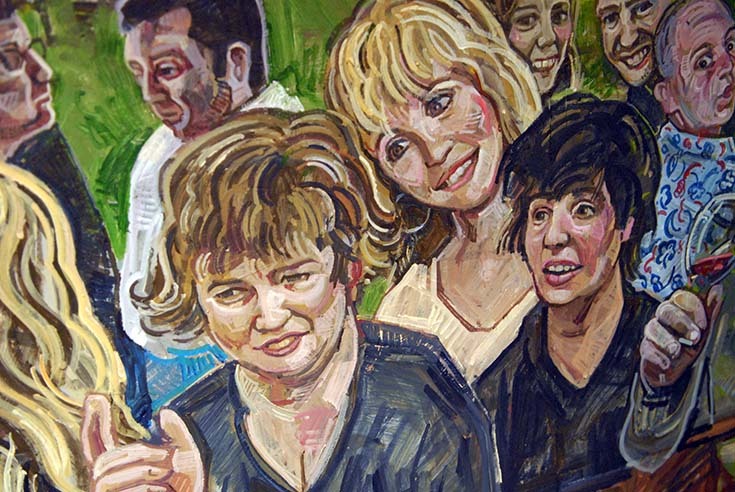 Scottish singers Susan Boyle, Lulu, and Sharleen Spiteri of the band Texas make an appearance in the mural. Room in the West End owner Peter Knight enjoys the company of Sharleen Spiteri, KT Tunstall and Annie Lennox at his table in the mural. 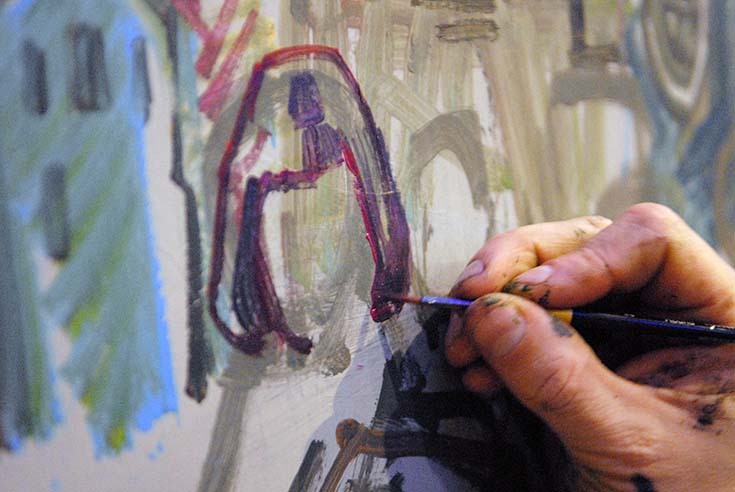 Chris painting the mural in the early days of its progression – the skyline has been completed but the portraits are yet to start. The only real issue has been negotiating painting time around the comings-and-goings of a successful restaurant. In order to not disrupt the customers’ meals, I’ve had to work in and around the Christmas rush which has meant arriving at 7am and leaving around 2pm. After the initial painting of the Edinburgh skyline, each day by lunchtime I have typically managed to produce around ten portraits. Painting the first portrait of the mural. Chris consulting his iPad during painting. My plan is to finish the mural by mid January and launch the mural publicly in time for the Six Nations tournament – hopefully with some more famous rugby faces identifiable in the crowd scenes.